Putting is one part of the game where you can do things very different from the rest of the field yet still get the intended result. For example, Tiger Woods is very different from Jack Nicklaus or Brad Faxon but all of them were amazing putters. Some are crouched over the ball while others are standing tall. 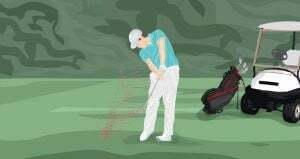 Some have a long fluid stroke while others jab at the ball. The best putters in the world get the ball to stay on line and roll true because they get so much topspin. If you’re putting poorly, there’s a good chance you aren’t making the moves in your stroke to generate top spin consistently. A lot of times, you will find that when you’re putting poorly, you’re most likely hitting down into the ball. 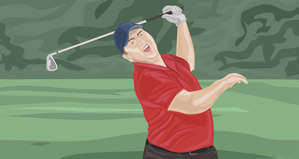 Or, you are hitting up into the ball too much which gets the ball airborne and starts hopping on the green. Either way, both of these make it hard to have great putting days. To help you make more putts by creating top spin (or overspin), keep reading. I’ll cover exactly why you want topspin and some of the best drills to help you get started. So why do you want overspin (also referred to as topspin) at all? 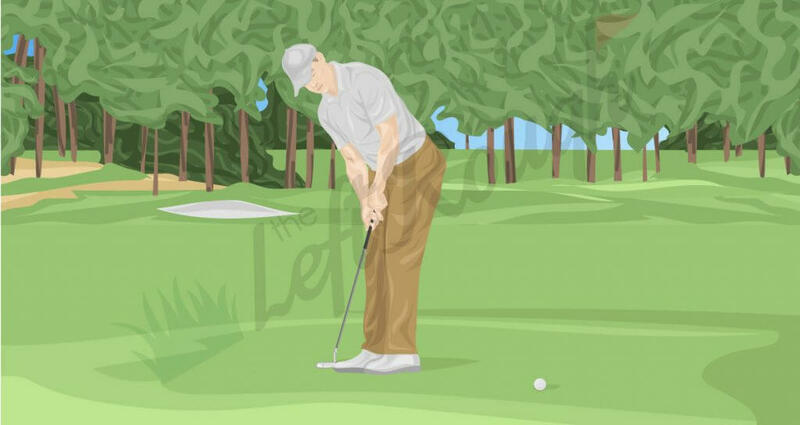 The idea is that as soon as you hit the putt, you want the ball to roll end over end so it travels nicely and smoothly on the green. Think back to when you were rolling it well in the past. I’m sure you can picture the ball coming off the putter smooth and almost sticking to the turf. 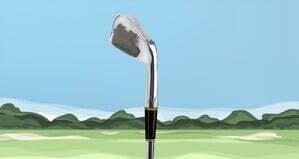 On the other hand, if you hit down on your putts or way up on your putts, you can probably picture the putts jumping off the putter face. There isn’t much worse than seeing this as the ball can end up offline and usually way short of the hole. This usually leads to more three putts and way more frustrated than you need. To alleviate some of this stress, remember that the goal is to create a stroke that you can make repeatedly. Ideally, the perfect putting stroke should be slightly inside to outside which naturally makes it easy to create topspin. Don’t forget that puts hit with topspin will roll true and stay on your intended line. They have the look of being on top of the grass as compared to putts with side spin that look like they are digging or tracking into the grass. Whenever you want to change something in your game I recommend finding someone who’s mastered it to learn and watch them. In this case, Jack Nicklaus is the king of creating topspin on his putts. Whether you think Tiger Woods or Jack Nicklaus is the “GOAT”, it’s hard to find a better example of topspin than Jack Nicklaus. Just like Tiger, he made the big putts when he needed it most. He seemed to will it when every other golfer on the planet would have missed. But one of the reasons Jack made so many putts is the massive amount of topspin his hooking motion putting stroke produced. If you watch old footage, you can see that he got well behind the ball at address position. When he did this, it allowed him to hit up on it with a hooking motion. Think of it like creating topspin with your forehand in ping pong. He also had a naturally inside to outside stroke that made it easy to release the putter. Lastly, the putter went from low to high through impact with the toe closing. When it comes to being a great putter, it’s important to have a small amount of forward shaft lean at impact. One of the best examples of this is Phil Mickelson. His forward shaft lean is extreme and while it looks like he overdoes it, it’s actually because his putter is 6 degrees and his forward press turns the club into 3-4 degrees of loft. The goal is to get your putter to be 2-3 degrees at impact. More than this and you can hit up on it too much and get it jumping off the face and go offline quickly. One of the mistakes so many amateur golfers make is the wrong ball position at address. It should always be in the front center of your stance. For really long putts which require a longer stroke, you can move it back slightly back. But for the most part, keep it consistently front of center. This will help you hit the ball at the right of your stroke and produce the most topspin. Don’t forget to check out our guide to the putting stroke for more tips and tricks to become an awesome putter. Here are two of the best drills to help you learn how to put topspin on the golf ball. On a putting green, use range balls with the stripe. 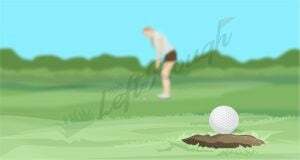 This will show you a pure end over/top spin putt by rolling a putt hitting the stripe. This is done by placing the stripe on the ball set as a vertical equator to the green. When hit with a stroke that produces topspin, the stripe will roll perfectly all the way. Ideally, the stripe will stay vertical rolling end over end. Do this drill if you’re struggling to make putts and need the visual representation of end over end. As you can’t ground the putter with the clubs, it will force you to high slightly up on the ball creating topspin. Hover the putter above the alignment rods and repeat 5-10x (or more) to ingrain the feeling and watch how smooth the ball rolls off the putter. Also, don’t forget to check out the best putting drills post to learn more ways to hone your short game. Remember, creating backspin on your putting stroke is the enemy of great putting. 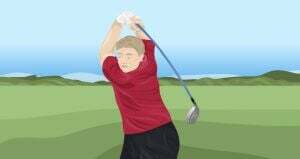 When you have overspin on the golf ball, it will roll truer and hold the line much more consistently. This is especially true on longer putts where speed is even more important than short or mid-range ones. When you’re able to create topspin consistently, the ball will end up rolling and tumbling end over end downward in its forward movement. The type of forward motion will make it less likely to get affected by bumps, divots or spike marks on the green. 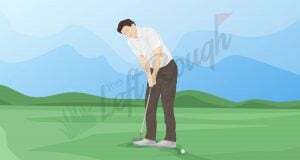 Plus, this forward motion will give you a better chance of making more putts as the ball will be more likely to tumble into the cup instead of spinning sideways for a nasty lipouts. Once you can create some good topspin, you’re going to roll the ball better and you’re going to make more putts. To help your results even more, remember that most of the great putters were also die putters. When you hit the putt with topspin and a “die it in” approach, you’re going to make the hole more accessible and avoid more three putts than you ever thought possible.